Have you made the decision to remodel your home to fit your family’s needs instead of selling and buying new? If that is the case, then you need to protect this huge financial investment from unlicensed unprofessional contractors. With your home on the line, it is imperative to find a contractor you can trust. As a top remodeler in Southwest Florida, Luxury Home Solutions (LHS), has the top tips to guarantee you make the right choice when you find, assess, and hire a remodeler. Make Sure You Hire a Pro! The best place to start is to contact your local building departments and associations to obtain a Directory of members. You can go to the Collier County Building Association, CBIA, website at https://www.cbia.net/membership/member-directory/ and Lee Building Industry Association, LBIA, at http://www.bia.net/members where you can download local remodelers through the online directory. A professional remodeler will uphold the highest professional and ethical standards in the industry. Using the above Building Industry Association Directories can help you find a remodeler who specializes in a specific type of remodeling that you might need, such as a Certified Aging-in-Place Specialist (CAPS) to help change your home to better suit you as you age, or a Certified Green Remodeler (CGP) to create a more energy-efficient home. Start your research by viewing the prospective remodeler’s company website and social media accounts to see photos of their work. Visit review sites like Houzz to see more pictures and to read reviews of remodeling companies. Take the best with the worst whilst reading online evaluations and reflect on the descriptions of experiences and qualities which can be most vital to you as a patron. Ask for referrals from friends, family, acquaintances, coworkers, and others who’ve had remodeling work performed on similar homes with comparable schedules. Once you have an index of prospective remodelers for your home renovation, do a little more investigating to confirm that they’re licensed and have a terrific business record. You can check their license on the State of Florida Department of Professional Regulation website. Look them up with your local or state office of consumer protection. You can also get actively licensed contractor lists from Lee County Building Department here and Collier Building Department here! Make sure you are compatible with the contractor you select. Beginning your project with mutual expectations will go a long way towards a smooth remodel. You’ll spend a lot of time with your remodeler so it’s important to have a good rapport and trust with them. You are asked to obtain the permit. A licensed contractor who is in good standing will always obtain the permit; unlicensed contractors cannot pull permits. The verbal contract only; contractor is not willing to put all terms in writing. This is always a sign of potential trouble. The contractor does not have proof of insurance. All licensed contractors must have current general liability and workers’ compensation insurance at all times. You are informed that the job does not require a permit or an inspection. Check with your local building official. Almost all projects that involve installing a pool or pool cage, building an addition, have mechanical, electrical or plumbing work require a permit! For jobs requiring a permit, make sure the contractor asks you to sign the “Notice of Commencement”. Someone other than the person or company contracting to do the work obtains the permit. As previously stated, a licensed contractor who is in good standing will obtain the permit. You are asked to make your check payable to an individual’s name (it should be made payable to a company), or asked to make payment in cash or to make the check payable to “cash”. Licensed contractors will almost always have a separate business account. Finding a licensed reputable remodeler can be difficult and many are duped, but if you stick with the tips above you will find the right remodeler for your home renovation project! When you’re searching for a remodeler or custom home builder in Fort Myers, Bonita Springs, and Naples Florida, look no further than LHS. We’ve been remodeling and building custom homes for more than 35 years, so you can sit back and relax knowing we have the experience and devotion to remodel or build you a wonderful, custom home. We are the remodeler and custom home builder you can trust! To learn more about our home remodeling work, click here. To get started click here or call 239-728-2143 to get a hold of our team today! More Warning Signs of an Unlicensed Contractor here! After reading through the checklist and examining your home do you need help fixing everything? The number of repairs and updates on an older home can add up and turn into a larger repair project. LHS specializes in complicated repairs and remodels throughout Southwest Florida. LHS is your home solution for remodels and even new custom home builds. Contact LHS today by calling 239-728-2143 or tell us about your home project here! Pressure-Treated Lumber: Creates that traditional hardwood look but entails lots of maintenance and is very vulnerable to distorting. Redwood: Woods like Redwood and Cedar are somewhat more hard-wearing, but are often costly. Composite: Plastic or a composite material needs very little upkeep after installation, but can be restricted in terms of color and style choices. Aluminum: The best long-lasting material and also the most expensive. Add a grand dining area with a large table to accept a party full of people. You can anchor the table with a canopy that will provide protection from the sun and rain, as well as add style to your backyard. Add a lounge area with comfortable casual outdoor seating including lounge chairs or even a couch. You can put a table or fire feature in and around the seating to provide a warm atmosphere. Put in a game area by centering space with an outdoor rug and then adding in a foosball, ping pong, or even a shuffleboard table. The game options are boundless, so you can find the right outdoor set with ease to entertain your family. Do not forget the outdoor kitchen! Every backyard has an outdoor kitchen and adding another level to your deck that features the outdoor kitchen will provide multiple levels of entertainment and architectural detail to your yard. You can keep your outdoor kitchen simple with just a grill or go all out with a built in grill, countertop, fridge, beer keg, and so much more! Furthermore, the incorporation of an outdoor kitchen and/or wet bar is an amazing option for those who do not want to be trapped in a kitchen while the fun happens outside. The deck Ideas for better backyard fun are endless. You can do so much with a deck and even more if you incorporate multiple levels. Similarly, make sure your deck is equipped with adequate lighting and even a few speakers for music that will instantly create a party heaven. Are you ready for your backyard deck project? You can let us know about your backyard project here! LHS is southwest Florida’s premier home remodeler and builder. You can view all of LHS backyard transformations here! When you’re ready, give us a call at 239-728-2143. Designing your living room is a bigger challenge than most will admit because it’s difficult to figure out how to center the room. You want your living room to be functional but also have style. Luxury Home Solutions (LHS) has been in the home remodeling, and design business for many years and has seen a lot of great ideas that make the living room a truly great room! Below are the top five living room centerpiece ideas that work to center the room for every homeowner. Use a fireplace or mantelpiece as a focal point to form a center of attention in your living room. Opt for a deep, ornate wood or black hearth to heat up space and make it feel comfy and welcoming. For a light and airy atmosphere, choose a white or bright color, stone or paint color for your fireplace. Everyone loves a fireplace even in sunny Florida they are a cornerstone for all homes. A fixed floor-to-ceiling bookshelf on a full wall of your living room can produce a powerful, structured central point. In order for the bookshelves to take the stage, keep the remainder of your furnishings unostentatious. It’s an excellent choice for people who would love a fireplace, but don’t or can’t have one. To inject your own personal design pack the shelves with your favorite books or different things you’d prefer to show. Putting in a large bright chandelier at the entrance of a living room is a really great way to welcome people to your grand home. Also, You can put a chandelier centered above your lounging or conversation area to make them a focal point. If you have a larger living room with more than one section define the spaces with a smaller chandelier above each area. You can get chandeliers in all styles, colors, sizes, so if you aren’t a glam person who would like the traditional crystal look you will still be able to find a chandelier to center your living room. Fashion a proper conversation space as your living room’s focal point to create it an area that you can simply enjoy engaging guests. Use four armchairs organized around a small coffee table and add some simple décor, like a vase of flowers or different level candles. To form an upscale, warm atmosphere, use giant comfy arm chairs and place a wood table between them. If you’d need even more seating, you could compose two completely different sets of arm chairs on opposite ends of a longer coffee table then situate a sofa on the length of the table. Section off your living room by placing your sofa in the center of the room facing the main wall. Put a sofa table along the backside of your sofa to create depth in the room. Then top the sofa table with big decorative items like sculptures or vase to make a grand focal point. Choosing the right colors for furniture and pairing the right pieces can set the mood of the room having a positive effect on the function. If you get stuck on the design of your living room or any room of your house give LHS a call and our team of designers will help you. We specialize in luxury home building, remodeling, and design and we build and remodel homes in Naples, Fort Myers, Bonita Springs, Marco Island, and other surrounding towns. To look at our home remodeling photos, click here. To get started on your home remodel, click here or call us at 239-728-2143. Pool tables are frequently a central point in special game room transformations; they’re a great way for both children and adults to hang out. Installing a pool table is often a difficult task and it’s predominantly because of one reason, spacing. Imagine finishing your home entertainment room remodel, and realizing you don’t have enough room to play. It’s a nightmare that’s far too common. Well, Luxury Home Solutions (LHS) is here to save the day! 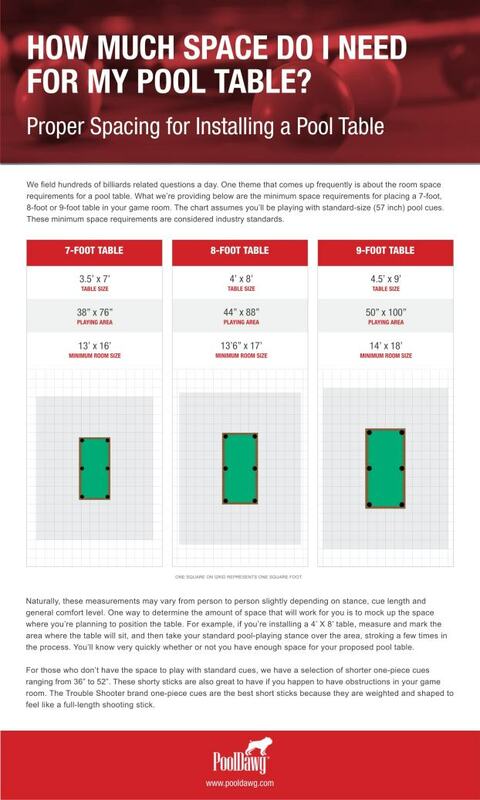 Below we’ve placed a chart, created by PoolDawg, which informs homeowners precisely how much space they’ll need in order to correctly use their pool table. Understandably, these distances may change slightly from person to person depending on height, stance and comfort level. If you need more assistance to get your pool table set up and to create a game room of your dreams please call LHS at 239-728-2143. Let us help you create a stunning game room for you and your family to enjoy every day. We remodel build custom homes in Naples, Marco Island, Fort Myers, Bonita Springs, and other Southwest Florida cities. To contact us about your project click here!